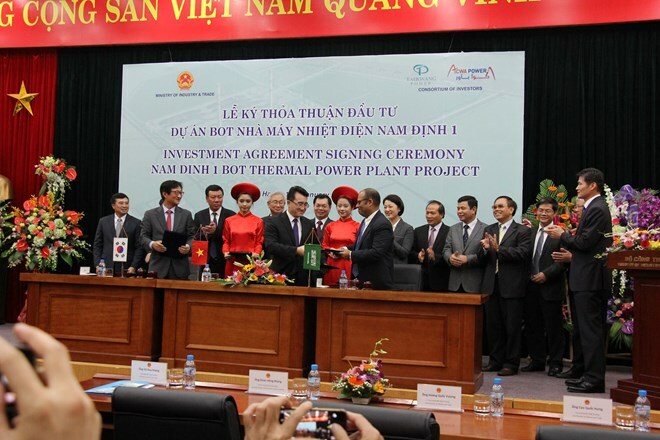 Hanoi (VNA) – The General Department of Energy, under the Ministry of Industry and Trade, on January 18 signed an investment agreement with Taekwang Power Holdings Co. Ltd of the Republic of Korea (RoK), and Saudi Arabia’s Acwa Power to build a thermal power plant in northern Nam Dinh province. The 2 billion USD plant will house two turbines with a total capacity of 1,200 MW, using coal supplied by the Vietnam National Coal-Mineral Industries Group. The build-operate-transfer (BOT) project is significant to the economic development of Nam Dinh and other northern provinces, as well as to ensuring national energy security. Addressing the signing ceremony, Minister of Industry and Trade Vu Huy Hoang asked the project’s relevant sides to promptly complete investment licence procedures. He also urged Nam Dinh to make preparations for measuring, compensation and land clearance work to implement the project as soon as possible. The project, together with the Vietnam-RoK Free Trade Agreement which took effect on December 20, testifies to the two countries’ efforts in realising their strategic partnership, the official said.